This is a list of the teams competing at Bit1 Finals. Cortex protocol is a puzzle oriented VR game, where you have to clear interesting mazes shaped like Rubik’s Cubes. Learn to think outside of the box by rotating the maze in order to find the exit while avoiding deadly traps and solving puzzles. All in the name of science! Your contribution will help us create a better future. Cortex Protocol is a game in development at Oulu Game LAB by the Arktik Kirkle. The game is developing by students from OAMK, The Erasmus and unemployed workers. The game is a 2.5D platformer where you control Bob who has decided to attempt escaping from Hell in order to meet his loving family in Heaven someday. Your mission is to go against all odds and find a way out using your abilities. You rely on explosions to move your character around and get through obstacles which makes for a unique experience. Team Bob found their passion for game making through Unreal Engine and lately all their free time has consisted of studying it. They want to make fun and impressive games but they also want to make them the right way. Team Colbanum is a team of five TAMK Games Academy students consisting of three artists (Piritta, Kalle and Kimmo) and two programmers (Jerri and Suvi). Space Hen Hassle was based on the idea of having chickens in space which quickly formed into a multiplayer arcade game. In SHH you play as tiny astronauts collecting chickens at a space farm. Your goal is to have as many chickens as possible at the end of each round. You can take a chance to sabotage other players by throwing your chickens at them – just remember to keep an eye on your own chicken count! Ninja! Not a Samurai!” is a game made by Team Death by Overwork at Oulu Game Lab. The team consists of 10 people in total who are dedicated programming, art and business students. “Ninja! Not a Samurai!” is a free-to-play puzzle card game for mobile devices. You get to play as our main protagonist Kuno, who is a ninja girl fighting against the invading forces led by enemy commanders. This game will put your strategic mind to test! The main idea of the game is to solve maze-like puzzles while collecting valuable treasures. The player controls Maia, an adventurous girl who follows her grandfather’s footsteps and tries to find the relics her grandfather never found. During Maia’s adventure, she faces many exciting puzzles and challenges. LunarByte Oy is a start-up software company, founded by students from Metropolia University of Applied Sciences. The team consists of seven people with a large variety of different skills. LunarByte Oy is a business-oriented team with high passion for games and entrepreneurship. Their mission is to create customer-oriented quality games with affordable price. As a small-time criminal you must survive the harsh conditions of the maximum security prison you are sentenced to serve your time. Life ain’t easy and you must make hard choices to survive. Jailbird Blues is a visual novel with randomized story events that make each playthrough a bit different. You also have to balance between four different factions to make through the ordeal alive. 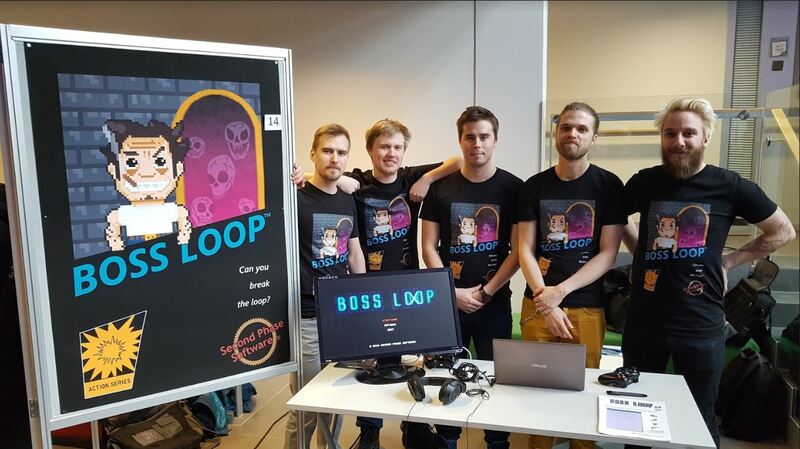 Team Penitent wardens got into action on March 2018 for Metropolia University of Applied Science’s Game project -course. Team Period of Play is a four student game dev team from Tampere University of Applied Sciences. Their team consists of two programmers and two artists, and this is the second game they are making together. Their current project has been thematically titled ”Dante’s Infernya” after the hell that you can raise while playing as the cat Virgil. Going on a rampage is your main goal – destroy all the items in the room while avoiding the owner’s attempts to stop you. The game features elements of 3D platforming, some stealth mechanics, lots of destruction, and of course – cats. Red Shirt Games is a team of aspiring game developers currently taking part in Oulu Game LAB. The team has nine talented members and has already created multiple game prototypes, following an agile “One Month-One Prototype”-approach. The latest game in development is Guild Inc. The game merges popular idle mechanics with light RPG-elements in a visually pleasing “hand drawn”-style look. In Guild Inc, the player is tasked with running a guild for adventurers: by selling and upgrading items, the player unlocks new items to sell and upgrade as well as new features in the game – ever expanding his guild business. Guns of Wreckage is a 2D Cabal shooter for mobile. Objective is to shoot enemies by tapping the location of the enemy on the screen and dodging enemy fire by moving sideways either by swiping, or tapping momvement points. Simple input action gameplay on a mobile platform. Everything works through by tapping the mobile phones screen (no buttons or digital sticks), making the gameplay be simple and easy to play. A cabal shooter for mobile platform, and also one of the first in the genre to have more variation in objectives. Team Wreckage is a group of students from Metropolia UAS. They all enjoy playing video games and being part of creating them too. Their team consists of three programmers, two artists and one designer and they are all excited to showcase their game to the public!